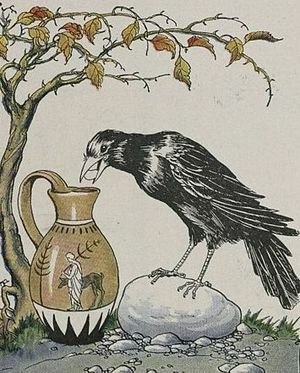 A crow, half-dead with thirst, came upon a pitcher which had once been full of water. The crow put its beak into the mouth of the pitcher and found that very little water was left in it and she couldn’t reach down far enough to drink. She tried repeatedly and gave up, in despair. Suddenly, a thought came to her, and she picked up a pebble and dropped it into the neck of the pitcher. She took another pebble, and another and another still, and dropped them into the pitcher. At last, she saw the water mounting up near her, and casting a few more pebbles, she was able to quench her thirst and save her life.